You can search the directory for specialty areas to suit what you need. 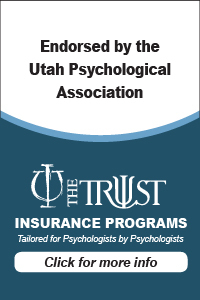 The Utah Psychological Association assists its members of approximately 300 psychologists, psychology researchers, graduate students of psychology, and high school teachers of psychology in the mission to advance psychology as a science and as a profession. Serving its members by providing access to the highest quality educational programs with the latest data on the science and practice of psychology. Advocating for public policies and legislation that promote psychological services and the psychological health of Utah. Promoting human welfare by the responsible encouragement of the development of psychology in all its branches in the broadest manner consistent with ethical and scientific standards. Creating and sustaining an environment of diversity and inclusion along with supporting increasing cultural competence for Utah Psychologists. Making psychology more visible to the public by providing public education on psychological issues, providing psychological resources and referrals, and disseminating psychological scientific knowledge. Recognizing community businesses exhibiting psychologically healthy workplace practices for a better work environment. UPA online has information about UPA’s Board, our goals; continuing education opportunities; news of our advocacy work at the Federal and state level; and much more. This is an unfolding website, so expect changes as we develop it. Thanks for visiting and we hope you will return often! Interested in advertising an event or product through UPA? Click here for information. With the new year comes lots of new psychology publications we can't wait to get our hands on!! So, If you were going to shop on Amazon Supports UPA, just click the link/image below to access Amazon, and UPA will receive a small percentage for all of your purchases as a "referral fee". UPA earns 1-6% on all the purchases you make through this link and it COSTS YOU NOTHING! Remember to bookmark the linked page so that all your purchases end up giving back to UPA!!! Or, simply keep coming back to this page.